The world-famous Krakow obwarzanek (pretzel) is at the centre of a bitter row as local bakers clash with traditionalists over its status as an official EU regional product. As of 30 October 2010, an obwarzanek has had to be baked according to the procedures laid down in its regional product description in order to legally be called an obwarzanek. One of these strictures requires obwarzanki to be prepared by hand, but at least one Krakow baker has started using a machine to boost production. Claiming the protection of origin certificate to be counterproductive, some are now suggesting that EU branding may actually harm the production of obwarzanki. “Our firm has invested big money to provide our customers with the best product at the lowest price possible. Is that wrong?” asked Malek Szubert, the baker at the centre of the machine-made obwarzanki controversy. His view is understandable. Last year, his Szubert Bakery bought a German baking machine worth three million PLN to make obwarzanki. Following the new regulations stating that the Cracovian pretzel must be made by hand, Szubert’s can no longer call their products obwarzanki, even though they taste, smell and look the same as their handmade counterparts. According to the text of the protection certificate, an authentic obwarzanek should range from light golden through dark golden to light brown and have a “distinct sheen.” The weight of an obwarzanek should not be less than 80 grams and not more than 120 grams, the visible strands of the spiral on the crust should be “firmish” and the crumbs inside “pale, soft and slightly moist.” Furthermore, a real obwarzanek can only be produced within the borders of the metropolitan area of Krakow and neighbouring Wieliczka. The long and well-documented history of the obwarzanek is one of the main arguments for its protection in EU law. The first reference to something reminiscent of the modern snack dates back to the 14th century when a Polish court document listed the circular bread as costing one grosz. In 1496, the obwarzanek was first referred to by name when King Jan Olbracht granted the “obwarzanek krakowski” special rights to be sold within the city’s walls. Five centuries and a 100-times price hike later, it was this ancient right, among other factors, that prompted the idea that the Cracovian pretzel should be designated as a protected baked good when Poland joined the EU in 2004. Kazimierz Czekaj, Krakow baker and city councillor, is one of the most strenuous defenders of the obwarzanek’s protected status. He is eager to stress the importance of the obwarzanek as a symbol of the city. “Expressed simply, the obwarzanek represents tradition and the unique history of Krakow,” said Mr Czekaj. It was Mr Czekaj who first brought the obwarzanek to the attention of the EU, lobbying intensively for it to be accepted into the family of protected Polish specialties. In 2007 he presented the draft to the European Commission that eventually led to the protection of the obwarzanek. When asked what he thought about bakeries that risk losing revenue if they adapt to the strict EU rules, Mr Czekaj was unapologetic. The obwarzanek is not the only local specialty to have come under international scrutiny. A smoked cheese produced on the Polish side of the Tatra Mountains, called oscypek, caused a minor diplomatic crisis when local authorities applied for it to be protected by the EU in 2007. A very similar product is made on the Slovakia side of the mountains and Slovakian authorities responded with a protest against the Polish application, which was finally overruled when it was decided that the two cheeses were too different to be labelled as the same product. Legendary Zubrowka vodka had been denied a US import licence for decades because of trace levels of the banned substance coumarin in the bison grass that gives it its distinctive taste. This obstacle was finally cleared in 1999, when the distillery removed the substance from bottles exported to America. Across Europe, similar attempts to circle specific areas connected to a product have led to interesting consequences. When the producers of Newcastle Brown Ale planned to move the brewery across the river Tyne, they were told that their right to brew ale was to be withdrawn. The reason was that the required geographical restriction did not stretch far enough to cover the brewery’s new location, even though it was in earshot of the old site. Then, however, the producer managed to revoke the certificate in order not to risk losing the major part of its business. Another example is the origin protection of Stilton cheese, which can only be produced in a number of areas near Stilton, but —peculiarly — not in Stilton village itself. But it is hard to see how producers of the obwarzanek are going to be able to overturn the decision that the bread should be baked by hand. Nava DeKime, an American running a New York-style bagel bakery, appeared somewhat amused by the European way of making sure that everything is produced in the right place using the right procedures. Mr DeKime has been running Bagelmama in Kazimierz for about ten years, and said that in his country, few would worry about where something was made as long as everything was fine with the actual product. “If people are happy eating the obwarzanek, I don’t see a point in changing the way you make them,” he added. Luckily, as the bagel he produces is far from an obwarzanek (Mr DeKime is very clear on the difference between the two), he is not affected by the new regulations. Mentioning that the original New York bagel is only made by hand in very rare cases, he said that regulated baking procedures forbidding the use of machines could end up causing higher prices for customers. 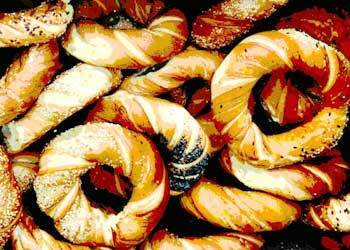 “If every bakery has to make it to an original recipe, the pretzel would probably be more expensive,” Mr DeKime said. In the centre of Krakow, an obwarzanek seller, crouching beneath a plastic shelter to avoid the heavy snow, agreed that the original obwarzanek is and should remain hand-made. “I think it is good that they are protecting the tradition, it is an important part of Krakow,” he said. His view is shared by another seller across the main square: “If an obwarzanek is not made by hand, it should not be called Cracovian,” she added. When shown the EU certificate specifying the nature of an obwarzanek, both sellers shrugged their shoulders. They said they had never seen it before. It remains to be seen whether the city council will introduce controls to ensure the authenticity of every obwarzanek made in Krakow. Kazimierz Czekaj said he would like to see controls, but that producers should be allowed time to adapt to the new regulations. I just want a recipe in English please. These polish pretzels are like none other.